Now that I've been quilting for 7 years, a certain number of quilts have amassed in my home. Some are class, lecture, and pattern samples, but the majority were simply experiments that brought me unimaginable joy. I might eventually pass on or sell some, but we all have certain quilts we'll hold onto forever (below are some of mine). I've always coveted a quilt ladder - a tall structure that would allow me to exhibit several quilts at once in a decorative and pleasing way. Plus, it would free up some other quilt storage space. Since we moved into our new place, I've been hemming and hawing about storage, since we still have a few more boxes to bring in from my parent's house. 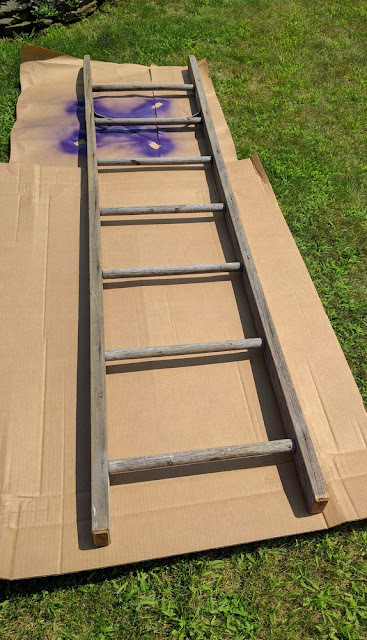 A couple weeks ago, my dear friend Jenelle (@jmontilone), who I'm lucky to see on a regular basis, texted to ask if I wanted a quilt ladder. Um, yes! This one was salvaged from a local site where a huge plant used to exist. It's even slightly wider at the bottom to accommodate larger quilts! Jenelle cut it down to my desired height (8 feet) and sold it to me for a fair price. We met for lunch and I stuffed the ladder into my car. And now, it's in our living area, and I LOVE it (plus, it matches our steely blue-gray curtains and Alison-Glass-fabric-covered ottoman, which I hadn't even planned!). There are a lot of opportunities here. First, it freed up a little space elsewhere. 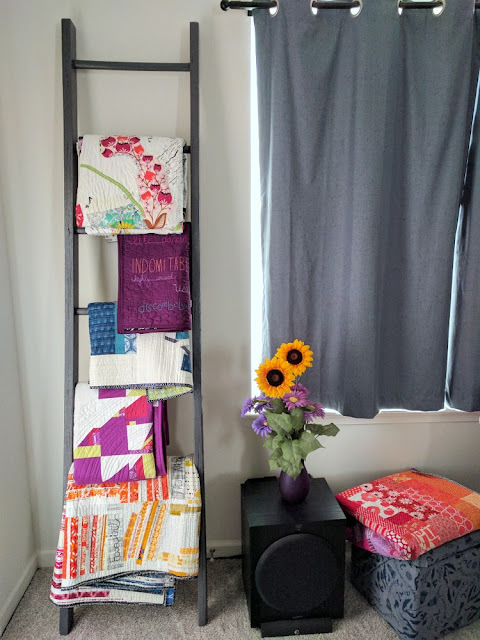 I can used the ladder to display seasonal quilts and table runners. There's the opportunity to fold the quilts in special ways so as to highlight a favorite part (I tried that with the flowers above). Plus, if you walk into the room (if there was any doubt), you'll know that a proud quilter lives here. :) This was a recycling project gone right in my book! Do you have a quilt ladder or stand? If not, where would you put one in your home? Knew you'd find one! Thank goodness for friends :). Looks great with your amazing quilts on it! You did a bang up job rehabbing that old ladder into a lovely art display. I quilt ladder has been on my wish list for some time. I am inspired anew to try to make that happen. Beautiful way to display your amazing quilts. I love the color too! I totally want/need one for my living room too! 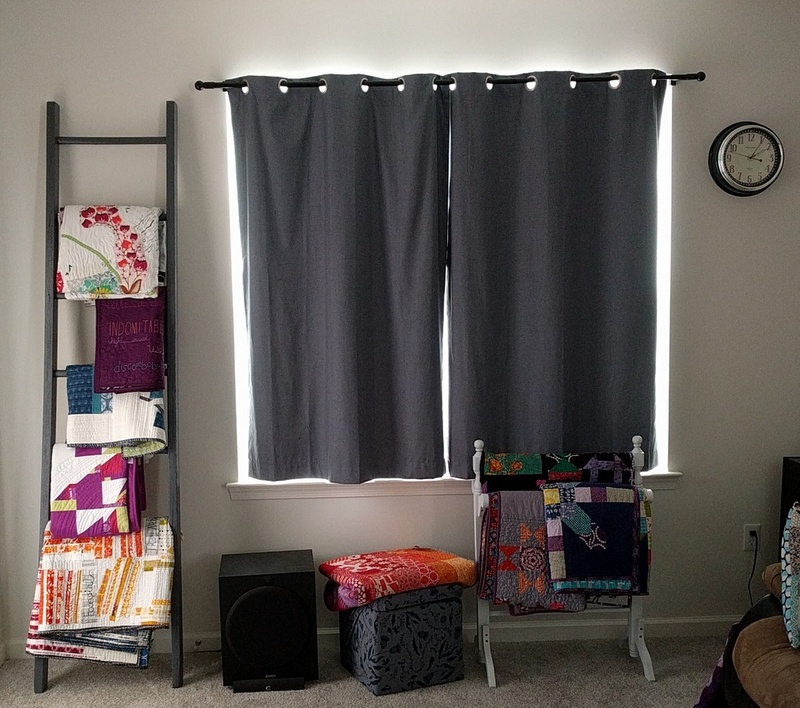 I have a quilt rack that holds 3 quilts, but one hangs on the back and is totally hidden. Plus my kids are probably old enough now not to climb it, right?